Set in England, Clock Tower begins with four girls being adopted by Mr. Barrows, a rich man who promises to give them the lives that they’ve so longed for. Escorted by his wife, Mary, the girls arrive at the mansion and while some have mixed feelings on the current goings-on, all seems peaceful and like things are going to go swell for these little ladies. That is until Mary disappears for a little too long. Taking control of Jennifer Simpson, one of the four ill-fated girls, you follow behind Mary, only to quickly be routed by a shriek from the main hall. When you return, all of your friends are gone and the lights have been extinguished. Where are your friends? Who is the enigmatic Mr. Barrows? Is this really a point-and-click game on the Super Nintendo? Truly enough, the game is point-and-click. While the pacing is somewhat slow, this does work in the game’s favor. Exploring objects and rooms hearkens back to old PC games and the like. Straight away, this this platform is not for everyone. This series also does not break this until Clock Tower 3 on the Playstation 2- but we’ll get there. The game would certainly be a completely different experience if it were a simple platformer, but the point-and-click does feel antiquated, no matter how much it lends to the atmosphere. You use the interface to pick up items for your inventory, move about the mansion, and generally everything you do. You get used to it. This game also has some cool mechanics. Not only are there seven different endings dependant on what items you pick up and what characters are still alive at the end of the game, but there is an escape mechanic. 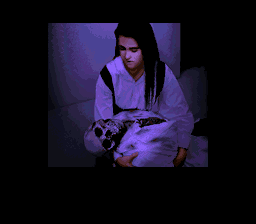 Since Jennifer does not use weapons, the best thing she can do while running away from Scissorman, the main antagonist of the game, is struggle when he gets too close by tapping the ‘B’ button, thus saving her life. She only has a certain amount of life, though, indicated by a small portrait of her in the corner of the screen. While the background of the picture shifts through colors- blue to yellow to red- it indicates just how much strength she has left. If the meter hits red, she’s too weak to fight back no matter what. Kind of like a ‘three strikes, you’re dead’ type of deal. There are plenty of things in the environments to help defend yourself, though, including hiding spots and makeshift weapons. It’s truly ‘survival’ horror, and it adds a sense of empowerment while retaining a sense of mortality. The plot is as contrived as a horror movie, but that doesn’t mean that you don’t sympathize with the characters. Of course, you relate with Jennifer most, and she’s a great protagonist for the story. As she comes across Scissorman, a nefarious being with scissors as large as his body and a desire to kill her and her friends, you really do feel like you’re watching a horror movie at times. The twists come at a decent pace, and every time you think you have something figured out, it changes on you or someone else comes into play (or goes out of play, depending on the character). It’s a well orchestrated game for its time and the genre. All of the pieces are there for an engrossing video game horror experience. The game is not without its flaws, but they’re forgivable. On occasion, the camera and movement are somewhat unwieldy, making certain tense moments tough to navigate. Running away from something or figuring out how to conquer some of the obstacles that arise can be tough to get just the right element in the room to help out or trying to enter a door when the camera moves on you at the most inopportune time. Also, Jennifer doesn’t always like to communicate when there isn’t something useful someplace. On the opposite end of that, some important things to pick up take one or two clicks to get the girl to realize it. In short, click on everything a few times. Oh, and if you can help it, try to make a map or look one up. Traveling around the mansion can get confusing, which both helps and hurts the atmosphere and the game. Where this game shines most is its exterior. The music, while sparsely used, is incredibly effective. Right from the clock tick in the title sequence to the pins and needles of the tense music and the bass synthesized chase music, the game really is great aurally. Even effects like Jennifer’s shoes on the hardwood floor and the parrot screaming ‘I’ll get you!’ are downright piercing in the right place and time. The game is definitely best played in a dark room with the sound turned up. The graphics are nothing to scoff at either. Highly detailed and, for the most part, fluid and natural looking, the graphics enhance the game as much as the music if not more so. 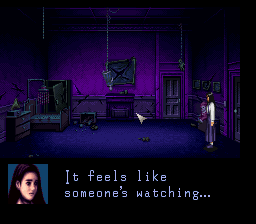 The game keeps a dark atmosphere with its Gothic and frightening backgrounds, but the colors never get dull. Burgundy walls, deep blue and eerily lit rooms, moss green grass; the game uses color and tone the way all games of the genre and time should. The game really is great to look at and listen to. 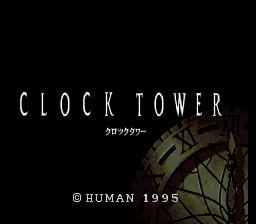 The long and short story on this game is that not only is it possibly one of the better games I’ve played on Super Nintendo, it’s probably the best in the Clock Tower series. While the point and click feel may not be for everyone, the game itself is a must for anyone who prides themselves a survival horror fan. The story and packaging definitely overshadow what technical issues there may be, and if you want a good video game experience to try to scare the pants off of you, this one may be the one for you.